The Negishi Line (根岸線, Negishi-sen) is a Japanese railway line which connects Yokohama and Ōfuna stations. It is operated by East Japan Railway Company (JR East). Freight trains also operate on this line, and it is essential for the southern Keihin region. The Negishi Line does not exist as an independent service. Nearly all passenger trains are operated through onto the Keihin-Tōhoku Line past Yokohama to Kamata, Tokyo, and Ōmiya; as a result, the entire service between Ōmiya and Ōfuna is typically referred to as the Keihin-Tōhoku—Negishi Line (京浜東北線・根岸線) on system maps and in-train station guides. Keihin-Tōhoku Line—Negishi Line trains are recognizable by their light blue stripe (the line's color on maps is also light blue). A few trains travel through to Hachiōji via the Yokohama Line. During the daytime, trains operate every 3 minutes between Yokohama and Sakuragichō stations (including Yokohama Line trains). Between Sakuragichō and Isogo, trains operate every 5 minutes, and Isogo and Ōfuna every 10 minutes. The Hamakaiji limited express service also operates on the Negishi Line. Freight trains are a common sight on the Negishi Line. The following rail companies either link up to or use the Negishi Line for the purpose of transporting freight. All stations are located in Kanagawa Prefecture. All trains stop at every station (excluding some seasonal trains). The oldest station on the line is Sakuragichō, which was opened by the Japanese Government Railways on June 12, 1872[note 1] as the first railway terminal in Yokohama of the first railway line in Japan. The line was extended to Kōzu on July 11, 1887; trains had to reverse direction at Yokohama via a switchback to continue their journey. This was alleviated by a bypass line between Kanagawa and Hodogaya which opened on August 1, 1898. The branch was named the Tōkaidō Main Line Branch Line on October 12, 1909. Takashimachō Station opened between Kanagawa and Yokohama on December 20, 1914 as the terminus of an electrified Keihin Line (the predecessor of today's Keihin-Tōhoku Line). On August 15, 1915, a new Yokohama Station opened, absorbing nearby Takashimachō and becoming the new terminus of the line. The old Yokohama station was renamed Sakuragichō and the Sakuragichō – Hodogaya bypass closed. Keihin Line service was extended to Sakuragichō on December 30, 1915 when freight service ceased on the branch. 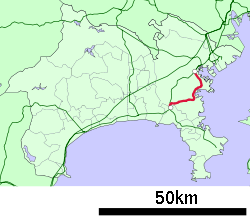 The line was planned to be extended to Ōfuna, and in 1920 the Government Railways decided that the extension route would be parallel to the Ōoka River and then turn to Hodogaya. From Hodogaya to Ōfuna, additional tracks would be added to the existing Tōkaidō Main Line. However, this plan was scrapped after the Great Kantō earthquake of 1923. Later, the planned extension was revived with a completely different route: "The railway from Sakuragichō in Kanagawa Prefecture to Kita-Kamakura" was added to the list of railways to be built in the Railway Construction Act on March 31, 1937. This provision was the basis for the construction of the present-day Negishi Line. Yokohama Station moved on October 15, 1928; between then and January 26, 1930, temporary platforms for the Keihin Line were provided on either side of the station. On May 19, 1964, the line was extended to Isogo. The line was renamed the Negishi Line after one of the new stations. The Takashima freight line opened on June 1 that year and freight service returned to the line after a nearly 50-year absence. 103 series trains were introduced to the line in October 1965. The line was extended from Isogo to Yōkōdai on March 17, 1970. The final section between Yōkōdai and Ōfuna opened on April 9, 1973; On October 1 that year, freight service commenced between Ōfuna and Isogo. Freight services between Ōfuna and Isogo ceased on February 1, 1984; three days prior to this, the line adopted Automatic Train Control. On April 1, 1987 the Japanese National Railways were privatized, with ownership of the Negishi Line passing to JR East; JR Freight took over freight services on the line. Some trains began operating through onto the Yokosuka Line on March 15, 2008. The Sakuragichō train fire occurred on April 24, 1951. On May 20, 1970 a 103 series train derailed between Shin-Sugita and Yōkōdai, injuring two people. ^ 「地図」で探る横浜の鉄道 [Explore Railways in Yokohama with Maps] (in Japanese). Museum of Yokohama Urban History. 2011. pp. 58–64. ISBN 978-4-9905683-0-6. ^ "鉄道敷設法中改正法律". Retrieved May 18, 2014. Wikimedia Commons has media related to Negishi Line.